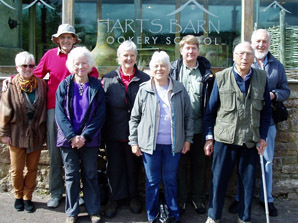 The first field trip of the year is always exciting, and on 25 April, eight intrepid dowsers from Slimbridge Dowsing Group assembled at Harts Barn Craft Centre in the Forest of Dean to investigate the history of the site from AD 1200–1800. The weather was splendid with a lot of sunshine and only a light breeze. We were joined by Titus, the estate manager, and Paul, who was there on work experience. Titus let us use an empty craft unit as our HQ, and Emma from the Peepshow Gallery laid on some refreshments, and got things organized for us. Dowsing indicated a Norman moated manor house built around AD 1200, probably by a knight called Sargeant, who had given valuable service to King William. It was a substantial building, three stories high with an attic, probably servants’ living quarters. Their water supply would have come from wells at the rear of the building and there would have been a chapel within the site. The manor would also have included a hunting lodge and kennels for the hunting dogs. Wild boar and deer would have been hunted in the forest, now known as the Forest of Dean. Their weapon of choice would have been the crossbow, which shot a metal bolt called a ‘quarrel’, necessitating a forge on the site, for which we also dowsed. Dowsing indicated that around AD 1220 the hunting facilities were enlarged to include stables and cottages for outdoor staff. The site is known to go back to the eleventh century, but we also found indications of Roman occupation, including a minor Roman road going through the site, and a bathhouse with a hypocaust, the Roman method of underfloor heating. An exciting project ripe for further investigation.